Food is a basic human need, and it starts with the basics of composting. With the world-wide trend of weaning away from chemical inputs, composting carbon-based materials is a sine qua non to a successful organic farm. We in Guinarona have the brain trust, manpower and resources to implement such program. 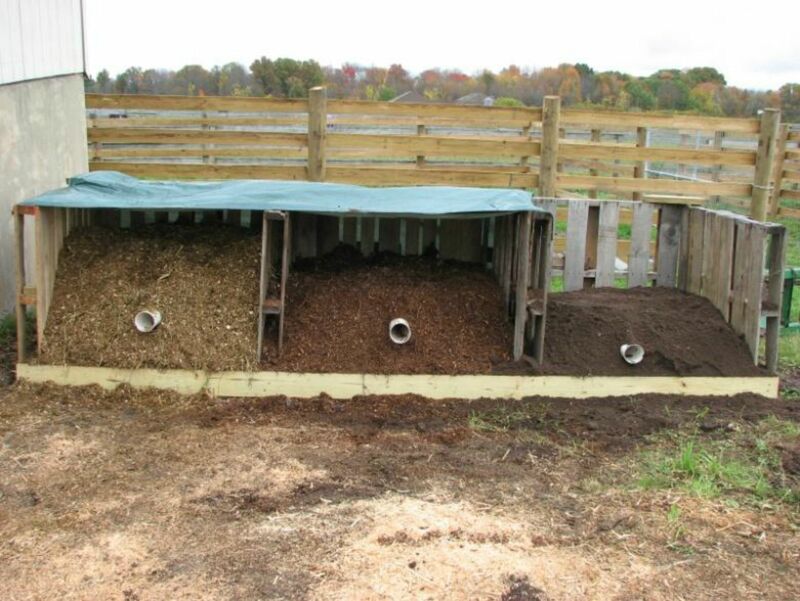 Below are the basics of composting manure. be it from horses, carabaos, pigs, chickens, etc. Many horse owners and small livestock operations do not have access to sufficient land to make good use of manure by spreading. Composting provides another option for managing manure on the farm. Microorganisms in the compost pile, including bacteria and fungi, break down the organic components of manure and bedding into smaller particles while releasing carbon dioxide, water and heat. The end product of composting is a dark, crumbly, earthy-smelling product similar to potting soil. Although manure can decompose on its own, composting speeds up this natural process. If done properly, composting decreases the volume of waste, kills parasitic eggs and larvae, destroys weed seeds, and transforms a potential liability into a marketable resource. Moisture: is necessary to permit biological activities and support chemical processes. Moisture content should be about 50-60%. When squeezing a handful of composted material, it should feel like a damp sponge; it will wet your hand with no free water drops. Moisture is continuously lost by evaporation due to high temperatures. Therefore, regularly wet the materials without soaking. To increase the moisture content of compost from 25% to 55%, add about 20-30 gallons of water per 100 cu ft of compost. Wet each load as you fill the compost bin. Air: Oxygen is needed for respiration of the microbes while breaking down the materials. Too much sawdust may compact so tightly that it will make the compost pile anaerobic. Thus, manure should be mixed with bulking materials, such as straw, lawn clippings (free of pesticides), leaves or hay. Inserting a perforated PVC pipe into the pile may also provide oxygen to microorganisms in the pile center. Appropriate C:N ratio: Microbes use carbon (C), which is the main element found in bedding material, as their source of energy. They also need nitrogen (N) for forming proteins. The challenge is to ensure the proportions of C and N in balance for successful composting. In general, less bedding in the compost results in a faster process and a higher quality final product. If the bedding material is sawdust, it takes a longer time to compost. Lignin, an important component of wood, resists decomposition by many microbes. Only a few fungi are able to decompose lignin to CO2 and water. Also the end product’s quality is low (high C:N ratio). Adding higher N content materials such as grass clippings or N fertilizer to the pile (e.g. 1 lb of urea per cubic yard of collected waste) speeds up the process and improves its quality. Temperature: During decomposition heat is given off creating an ideal environment for the microorganisms. They operate best in temperatures between 130–150ºF. At 140ºF or higher, pathogens, weed seeds and fly larvae in the composting materials are destroyed. However, at temperatures above 160ºF the microorganisms will also die. Therefore, it is essential to regulate the oxygen and temperature levels by regularly turning or inverting the compost pile (about once a week). Monitor the temperature using a long stemmed thermometer. Typically, fresh materials will heat up within 24 hours and within 2- 3 days internal temperature may reach 155ºF. At a point perhaps 2 ft. down from the top of your pile or bin, carefully insert the thermometer halfway into the side of the composting mass. Take temperatures at several locations to obtain an average. At the start, measure temperature at least daily for the first week. When the temperatures reach between 130-160, the time between measurements may be decreased to twice-weekly intervals. Declining temperatures early in the composting, indicate declining oxygen levels, but it may also be due to less than optimal moisture or inadequate available N for the microbes. After turning, the temperature may drop to air temperature, but should rebound within 48 hours. The thermophilic cycles may last 2-6 weeks depending on the starting C:N ratio. You can tailor your composting system to meet your needs depending on how many animals you have, the space and equipment available, and how intensively you plan to manage the compost pile. Compost Piles: Making compost does not necessarily require a special structure to store the materials. A simple, free standing pile can be turned into an effective composting system and works well for example, for a one or two horse operation. The pile grows as composting materials are continually added to the top or sides of the mass. When the pile gets too big, additional piles can easily be created. Covering the pile with a tarp to prevent rainfall soaking in, and frequent turning of the pile speeds up the process. Free-standing piles will require more space and careful consideration of location to prevent runoff and leaching of nutrients. Multiple bin composting system: In this system decomposition takes place faster and less area is used. A three bin system is recommended for small operations. The first bin is allocated to fresh collected waste until it is full. The material is then shifted into bin two for composting. Meanwhile, bin one can be refilled. When bin one is full again, materials in bin two are shifted to bin three, and materials in bin one are shifted into bin two. Shifting material from one bin to the next serves as part of the turning process. Ideally, by the time bin one is full again, materials in bin three will be completely composted. A simple low cost system for those handy with tools is to use 7 shipping pallets stood on edge to make a 3 bin system as shown above. Note: When done correctly, composting decreases the volume of waste, kills parasitic eggs & larvae, & destroys weed seeds.